The Sixth Form represents a new beginning. Students, however, continue to benefit from the excellent pastoral care offered at Tring School. The Sixth Form team are well-versed in the specific needs of post-16 students and, as well as supporting students through their time in the Sixth Form, offer guidance on the next phase of their lives, whether that is an application to university, seeking employment or taking a Gap Year. The pastoral programme in the Sixth Form is geared towards the needs of young adults and covers issues such as study techniques, preparation for university, citizenship and time management along with topics such as safe driving, sexual consent, living away from home and drugs awareness talks. Please click here to view our whole school Careers Program. There are many extra curricular activities including clubs, participation in the school's musical ensembles and dramatic productions and highly successful trips both in the UK and abroad. The Head of Sixth Form is ably supported by an Assistant Head of Sixth Form, full time Student Support Manager, part time UCAS Advisor and a part time Administrator. At Tring School all Sixth Form students study three Level 3 courses, for two years. There is an option for students to take a fourth subject after discussion with the Sixth Form team. At Tring School over 65% of our Year 13 Leavers go on to study at University and some take a gap year before applying and moving on to Higher Education. We have a dedicated UCAS Coordinator who works with students from March of Year 12 right through to A Level results and beyond, to provide support, information and guidance. The programme that the students follow throughout this 18 months is comprehensive with both one to one support as well as group sessions and whole year group presentations. This ensures that students have all the information they need to make informed and appropriate choices for their futures. All students are given training on writing a great Personal Statement and a full support programme, including one to one feedback, offered throughout June, July, August and September. These resources should help them get started. Below are some of the other most recent presentations from our UCAS Coordinator. We provide an extensive programme of support for Sixth Form Academically Most Able students, including those who apply to Oxbridge. 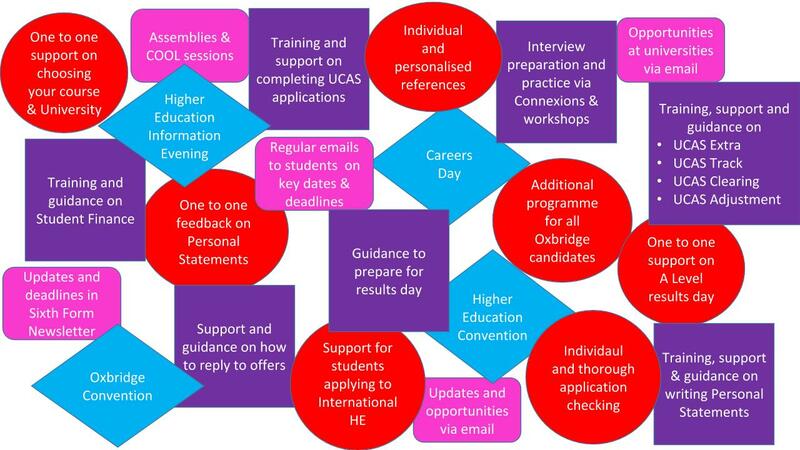 The UCAS website provides comprehensive information for students and parents and we highly recommend that you take a look. It is also worth looking at UCAS TV as there are numerous clips that provide essential information. 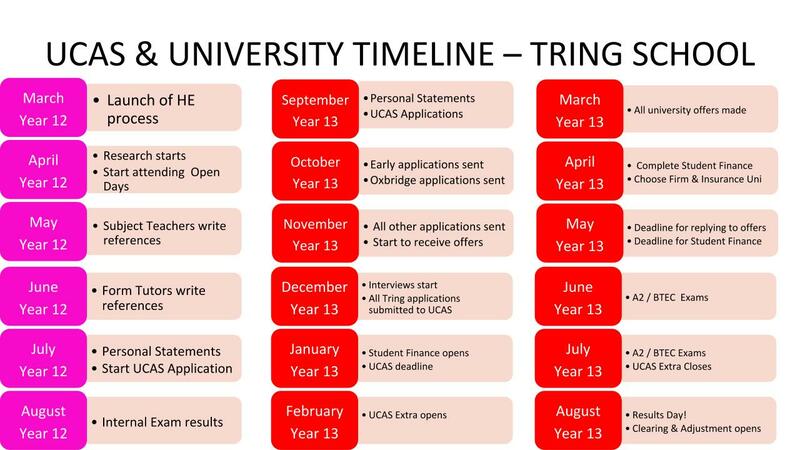 Tring School also offer all Year 11, 12 and 13 students the Unifrog facility which is a great tool to help students search for and compare university courses. Students just need to use their email address as the username and the password that they have been emailed. If it cannot be located, please contact a member of the Sixth Form Team. The course search facility on the UCAS website is also invaluable for looking for courses and linking into university websites. A quick guide for students concerned about how they’ll pay for university, click on link below for high level information about what is available. For detailed information about funding available, eligibility, application, payment and repayment for new full-time students click on link below. Many students decide that they are ready for the workplace following A Levels; we offer a range of support for these students in order to ensure they are aware of the opportunities available to them and well prepared for the application and interview process. During COOL sessions and Extended Learning Days we cover application and interview skills, networking, assessment centres, online numeracy and literacy tests, video interviews and CVs as well as looking at where to search for jobs and apprenticeship opportunities. We also encourage students to meet with our independent Careers Advisor. The Connexions and Sixth Form Teams receive notifications of job and apprenticeship opportunities which are posted on the KS5 Student area of the website. Please find below the presentation from the Tring School Apprenticeship Evening on July 3 2018. At Tring School, we know that it is vital to provide students with every possible opportunity to enrich and develop their skill set and we know that Work Experience will be imperative when it comes to writing job and apprenticeship applications and personal statements in the future. Year 12 Work Experience will take place in the week commencing 8 July and students will be encouraged to source their own placements, approaching businesses and organisations and securing a placement which is relevant and useful for their chosen career path. Parents will have the opportunity to hear more about the programme during the Work Experience Launch Evening on Monday 25 February. Please find information from the Work Experience launch below. Ensure your reason for taking a gap year is constructive. You can apply to Universities in September/October and defer your entry for a year. This is probably a good idea if you have a firm idea of what course you want to do. Or you can apply the following year – but then you will not be in school with the back up of our help. You do need to check if the course and Universities you are going to approve of gap years. Most do – but for certain subjects like mathematics and some of the sciences it might not be so highly thought of because there is a feeling that you will have got “out of the swing” of that particular style of learning. Most students gap years comprise of different things; travelling, earning money, work experience and shadowing, voluntary work. If at least part of your gap year is related to your chosen course – improving your foreign language, work related skills etc – then this is more likely to be favoured by Universities. Certainly gap years should increase your maturity, independence and self reliance and broaden your experience of life. They do cost – and so part of the 15 months is likely to need to be in paid employment. If you are travelling – then you need to decide whether you are going to do this independently or with an organisation – the latter does mean you have the organisations support, you will be part of a group with new people and you will be doing some form of work. You will need to explain in your Personal Statement brief details of your gap year proposals and the benefits you hope to get from it. There are many organisations that organise gap year travel or volunteer projects abroad and in the UK. Make sure that you do your research and organise it well. Look at the Gapforce website for information about volunteering abroad.